As you have probably discovered by now, the file system in Linux is structured differently from Windows. There are no physical drives—just a logical file system tree with root at the top (yes, I know, roots should be at the bottom, but this is an upside-down tree). In addition, filenames are often very long and complex with lots of dashes (-), dots (. ), and numbers in their names. This can make typing them difficult for those of us with limited keyboard skills (remember, you can always use the tab key to autocomplete if you are in the right directory). Sometimes we want to simplify the names of a file or we want to link a file in one directory with another in a separate directory. Linux has at least two ways to do this—symbolic (or soft) links and hard links. 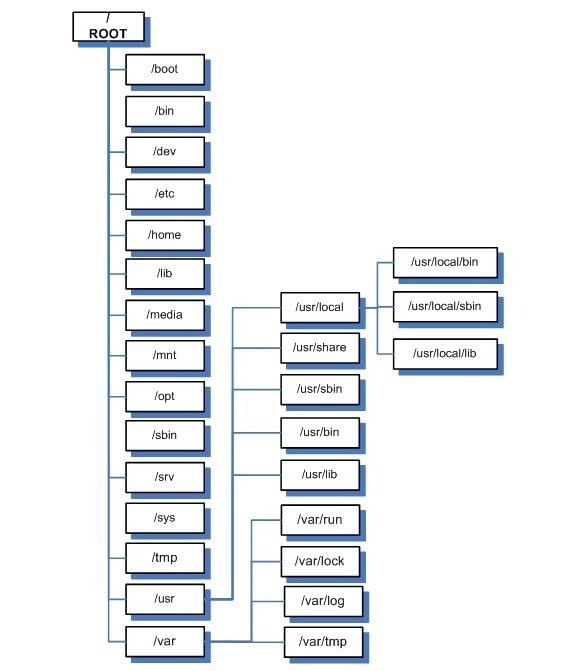 To understand how these two work and how they are different, we need to delve into some basic background on the Linux file system's internal structure. Let's take brief look at each of these. The superblock is the section that contains the information about the file system, in general. This includes such things as the number of inodes and data blocks as well as how much data is in each file. It's kind of a overseer and housekeeper of the file system. The inode table contains several inodes (information nodes) that describe a file or directory in the file system. Essentally, it is simply a record that describes a file (or directory) with all its critical information such as date created, location, date modified, permissions, and ownership. It does not, however, contain the data in the file. It's important to understand from a forensic perspective that when a file is deleted, only the inode is removed. Data blocks are where the data that is in the file is stored, as well as the file name. Now with that understanding, let's introduce two ways of linking files, the hard link and the soft or symbolic link. Hard linked files are identical. They have the same size and the same inode. When one hard linked file is modified or changed, it's linked file changes as well. You can hard link a file as many times as you need, but the link cannot cross file systems. They must be on the same file system as they share an inode. Symbolic or soft links are different from hard links in that they do not share the same inode. A symbolic link is simply a pointer to the other file, similar to links in Windows, and they have different file sizes too. Unlike hard links, symbolic links do NOT need to be on the same file system. Let's take a look at what links look like in our filesystem on Kali. Let's navigate to the /bin directory. 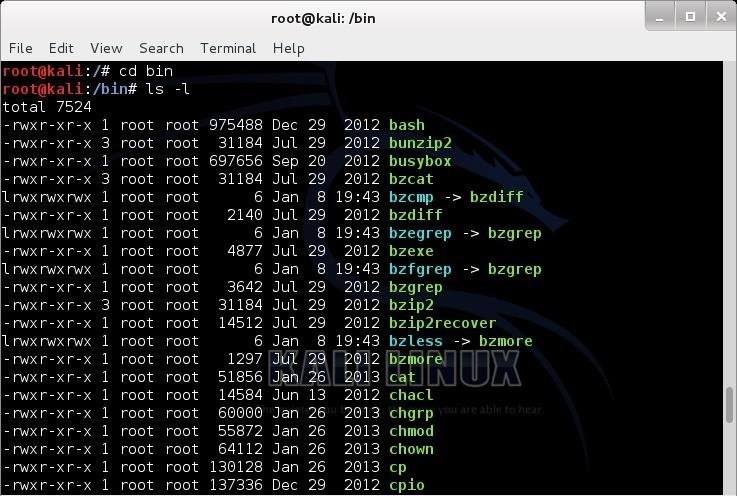 Remember that the /bin directory is just below the root of the file system and contains most the commands that we use on a daily basis in Linux. Now, let's look at the files in the bin directory. Notice that several files here show an arrow (->) pointing to another file. These are symbolic links. Also, note how small they are. Each is only 6 bytes. That's because they are only pointers, pointing to another file. The data block of the link simply contains the path to the file it is linked to. When you edit the symbolically linked file, you are actually editing the target file as the symbolic file is only that path to the target file. Hope that makes sense. Now, let's create some links. Let's start with symbolic links as they are probably the most common on most people's systems. Although symbolic links can be created anywhere, we will be creating them in the metasploit-framework directory to make starting the msfconsole a touch easier. Move to the /usr/share/metasploit-framework directory, first. Now, let's take a look at the this directory..
To create a symbolic or soft link, we use the ln (link) command with the -s switch (symbolic) and the name of the file we want to link to (the target) and the name of the link we want to create. You can use either relative paths or absolute paths to link the two files. Usually, when we want to enter the Metasploit console, we type msfconsole, remember? Now, let's say we want to change it so that we can simply type metasploit to enter the console rather having to remember msfconsole. We can link a new file, metasploit, to the old file, msfconsole, so that whenever we type metasploit it links or redirects to msfconsole. Here is how we would do that. 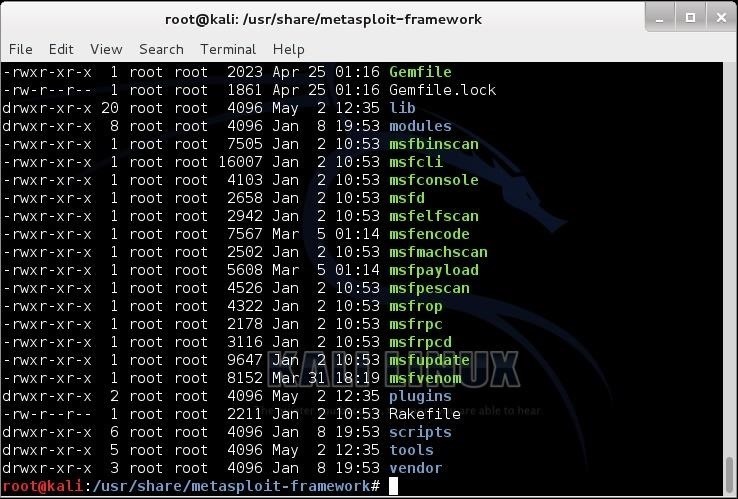 Note how small the symbolic link file, metasploit, is. It's just 12 bytes, because it is only a pointer. A path to the file it is linked to. 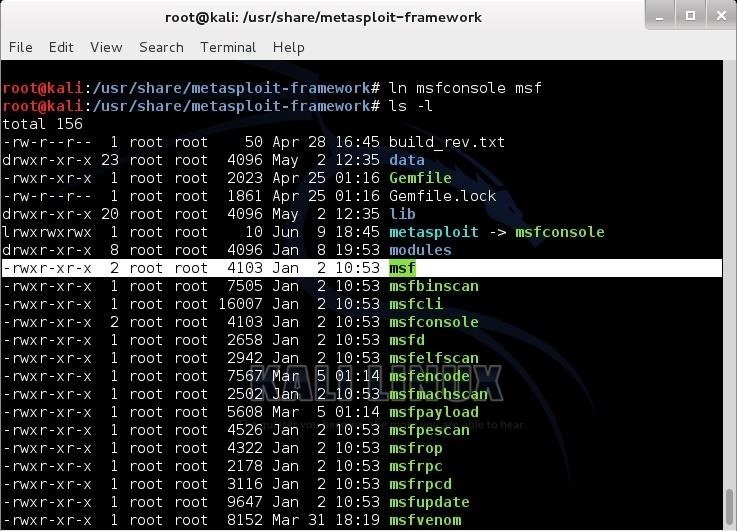 Now, to get into the msfconsole, I can type either metasploit or msfconsole and both will take me to the same place—the Metasploit Framework console. 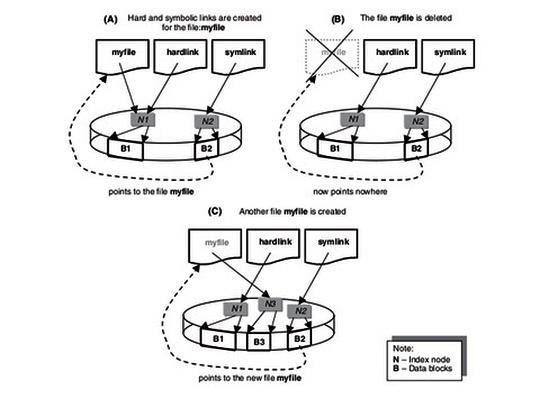 To create a hard link, the syntax is very similar with the exception that we use the ln (link) command without the -s (symbolic) switch, then the existing file to hard link to, and finally, the target file that will be created to the existing file. As you can see above, now we have created a hard link called msf. Remember, hard links share an inode with the linked file, so they are exactly the same size. Notice that our new file, msf, is exactly the same size as msfconsole, 4103 bytes. Now, when we want to invoke (start) the msfconsole, we have the option to type metasploit, msf, and the original msfconsole. All will work equally well. This happens no matter what directory I'm in. I realised that for some reason just typing 'metasploit' or 'msf' doesn't work, I have to type './metasploit' or './msf' AND be in the right directory for them to work... I still don't get how this is meant to work like OTW writes above.., any help much appreciated. This is happening because the link is not in your PATH(See the environment variables post). If the executable(or any other file) is not in your path you must provide it's path to shell . so by typing ./ you tell the shell that the link is in your current directory. So to use your link like Master OTW did you just add that directory in your path. In master otw's case the link must have already been in his PATH. you said that whenever a file is deleted ONLY the inode is removed . that should mean that only the description of the file is removed.right ? So , when is the data actually deleted ? And what if i do cp oldfilename newfilename , this wouldn't be equivalent to ln oldfilename newfilename as they now don't share a common inode .right ? By the way how & where can i take advantage of this shared inode , i mean what is the advantage of hard links ? The data remains until it is overwritten by another file. Copying the file (cp) makes two copies while ln (link) there is only one file with a pointer. So I followed the tutorial and I have a question. Concerning hard linking, we create a pointer to an existing file so they have same size. But it's not a new file so the size of the directory we are in won't change at all (I used the "du" command to check for it). We just add a new reference known as "msf" in Inode Table for msfconsole without changing Data Blocks content. Then the command "unlink" allows me to remove this hard link without removing the file it's linked to (msfconsole still working after that). My question is : if i type "rm msf", does it remove msf and msfconsole from Inode Table AND data related to msfconsole in Data Blocks ? Edit: No big deal but in step 2 you wrote "cd /usr/share/metasploit-console" instead of "cd /usr/share/metasploit-framework" if I got this right ! A little late but i think he put the one /../../metasploit-console because it is different on some systems. And to answer your question removing msf would not result in the loss of msfconsole as it's just a link. Soft links: You may use them across file systems, They are only pointers to the file you are wanting (they only hold the path to a file, or directory or program) but it's all the same. IF you rename the original file or move the file your soft link will be broken, if you choose to rename it or move it through the soft link i don't think it would break. When you delete the original file you do not delete the links, whether they're hard or soft links. What's the use to know the hard link and soft link? Is anyway to delete both inode and data of a file? The "shred" program, which is part of the GNU coreutils, which nearly all linux distros use, will overwrite a file 3 times (default setting) with pseudorandom data, which makes it extremely hard to recover any of it, even with expensive data forensics equipment. Note that shred will not, by default, unlink (delete) the files it shreds, and it will leave their inode entries (filename, permissions) intact. One can either use rm for that job, or set the "-u" flag of shred, which is even more secure because shred now also overwrites the bytes in the inode entry. Note that this may not work as expected on journaled file systems like ext3 if they are mounted in journal mode (which on most desktop systems they wont be but it doesn't hurt to check). One can consult the man-page for more information. Warning: unwisely used, shred can quickly destroy a users data and/or make a system unusable. Usage of common sense at all times is required when working with powerful utilities such as this. You have been warned. is file system means directories?